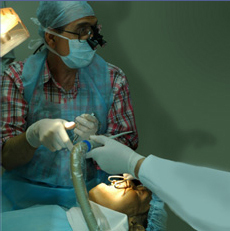 Implantologist Mumbai,Dental Implantologist,Canal Treatment,Orthodontics,Dental Care Treatments. Over 35 million Americans have some level of anxiety when it comes going to a dentist. But for many it is more than being afraid. Some of our patients have had a previous traumatic & painful experience in a dental chair. But regardless we are here to encourage through oral sedation or conscious sedation. In the latter an Intravenous sedation technique is used where in the patient is asleep but yet not totally unconscious but still remains unaware of the treatment. Many patients have little or no memory of the visit.